Are you a young person living in Cyprus? Do you want to be part of your community by engaging in civic life? Do you want to develop your skills, knowledge and competences through training in volunteerism and participation in voluntary activities? 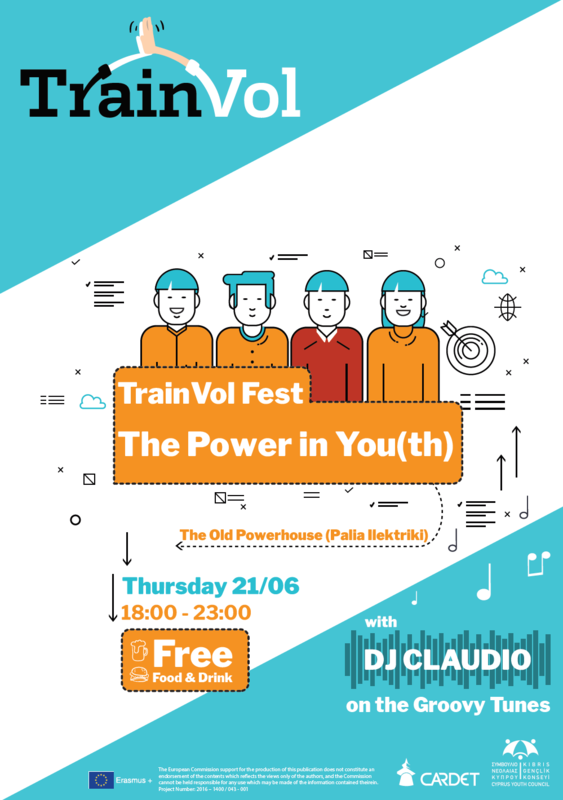 If the answer is YES, then the TrainVol Fest is an event not to be missed! The TrainVol Fest promises to be an exciting and dynamic event where young people will have the opportunity to meet with Charity and Non-Profit Organisations, offering a variety of opportunities including volunteering, networking, and getting involved with long-term projects with community organisations as well as international projects. Old Powerhouse (Palia Ilektriki), in Nicosia, Cyprus.  Dance, Music, Food, Volunteering Opportunities, Networking and many other surprises! The Fair is free and open to everyone. The Volunteering Fair “TrainVol fest” is organized by the Centre for the Advancement of Research and Development in Educational Technology (CARDET) and the Cyprus Youth Council, under the framework of the European Project “TrainVol: Capacity Building of Civil Society to Strengthen Volunteerism Management and Promote Volunteerism among Youth” [Project Number: 2016 – 1400 / 043 – 001].